Finally settled on the blog’s name….Studio Insider! After changing the blogs name several times (and having some silly ones) I have finally decided! Studio insider is the name and it will be set in stone from here on in. Everything I do on here will be mainly focused on home studio stuff so it made sense to me. Now for more blogging activities! 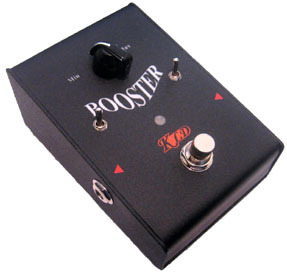 The Kldguitar FREQ Booster is a discrete FET preamp pedal with a low impedance output. It is based around the classic Xotic EP booster and produces a shimmering boost tone that adds some high end sparkle and definition. It features up to 20db of gain on tap with two switches to customize the boost. One is a Bass Boost and the other is a Bright switch. The default setting is Bright on/Bass Boost off. This provides extra sparkle for the darker sounding instruments and is great for that extra edge or shimmer. The Bass Boost adds just the right amount of low end for single coils to keep up. By turning off the Bright Switch you can get a full frequency boost that is transparent and gives you back what you put in. It’s review time again and this little pedal from KLD http://www.kldguitar.com is featured today. This pedal is based off the preamp section of an Echoplex EP-3 there is one volume control that provides up to 20db of clean boost into your signal. Toggles switches are included on top of the pedal for bass and bright settings. This is a welcome addition as the Xotic EP Booster has these controls located inside the pedal which makes accessibility a hassle, not so with the KLD Booster! Thumbs up here. These are 100% hand-made in China and the quality of build is excellent throughout with a nice heavy and thick steel enclosure. The footswitch is heavy-duty and is easy to stomp on and off. The sloped face design is good on pedal board as it makes accessing the pedal with your foot easy. A fairly bright red On/Off LED is included although it isn’t super bright it is perfectly visible when the pedal is engaged. This pedal also features true bypass. Battery access is via a thumb screw on the bottom of the pedal and makes battery changes easy. Also with a current draw of only 5ma you can run this on a 9v battery for many hours. This is where things get interesting. This pedal provides an enhancement to your guitar tone. With the volume control setup far left (off) there is still a slight boost to your guitar signal when engaged. The tone seems to get uplifted with a fuller sound and more sparkle on the top end. You can tailor the sound by toggling the bright and bass controls giving you a flatter bass response or treble or boosted response for both. With a valve amp on clean it adds a 3 dimensional sound to you guitar which is excellent. When overdriving the amp with a pedal or the amps onboard overdrive the pedal pushes the signal harder and causes a lovely extra layer of gain without any added compression. As a lead boost it works very well with the amount of boost on tap. Even with the volume control at noon the tone is boosted significantly. You can get some really creamy lead tones with this pedal pushing your amp. I especially liked this pedal with the following chain. KLD Booster into a compressor and then into an overdrive pedal to amp. this was blues heaven with a fat, round and bold overdrive tone! If you are looking for a FET based booster for your rig you could do far worse than the KLD Booster! This isn’t just a boost in the tradition sense, this is a tone enhancing pedal and boost. Add some preamp sparkle and low end to your guitar especially when stacking pedals. Price wise these run about $80 which is far cheaper than the competition. A great all round pedal no complaints at all with build, features, tone or price. It’s a busy time for me right now but I have some great reviews coming up soon. All coming very soon stay tuned for fresh content on a regular basis! I’ve had these headphones for a while now. I use them for monitoring purposes in the studio, checking mixes and for listening to music in general. The construction appears to be good, particularly higher when compared to most affordable headphones. It’s a combination of metal for the most part and plastic here and there. They are comfortable to wear, the synthetic leather is soft and durable. Your ears don’t seem to get too fatigued when wearing them. The headphones also flex a little and move with your head and there are no noises from them when this happens. Good for tracking with as microphones won’t pick them up if you move and also the sound cancelling both when wearing them and from outside of them is excellent. No mic bleed here then. The cable is detachable which I like as it avoids breaking them if he cable gets a tug. The cable length however is shorter than I would have liked. Internally inside the cups the drivers look of high quality and Sony boast that they are made of 40mm Liquid Crystal Polymer Film diaphragms. Apparently that delivers rigidity and lightness for balanced sound reproduction and minimal reverb. Minimal reverb? I’m not sure I’ve ever experienced what I would call reverb when wearing cans but OK.
Now when comparing these to a couple of set’s of headphones I has lying about the studio they sure are a considerable step up in terms of sound quality. One set of headphones I have suffer from minimal bass reproduction and too many highs. 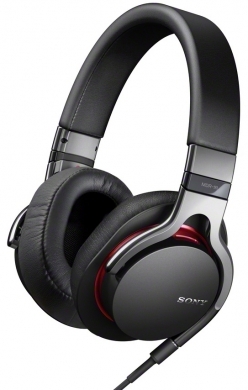 The Sony’s have great bass reproduction and smooth highs in comparison. The other headphones I compared them to had reasonable low end but it was loose sounding and fairly smooth high and midrange (not as smooth as the Sony’s though). Speaking of midrange, the Sony MDR-1R’s seem to lack a little power in that area. I would say they sound similar to the old graphic EQ trick on hifi’s when people would shape a V into it causing a dip in mids and a boost in high and low frequencies. For that reason when mixing on them or monitoring sound you have to be aware that the are not representing the full midrange of source material and not get fooled by them. This does however make them sound excellent for listening to commercial music on. OK this one is where Sony loses point. These cost £299.00 rrp, that’s a lot of dosh for some cans. I would say they are excellent sounding but I don’t think they are good enough to warrant that price. If you’re a studio guy then these aren’t recommended for mixing but for referencing mixes they would be fine. For home listening they are really good but not good enough to pay top dollar. I’m in the process of revamping my home studio setup. Providing I stick with my list of specific equipment I am planning to buy I will be replacing the following bit’s of gear and as I go along reviewing / demoing each piece of equipment. This blog will probably be very busy with studio updates most of which I hope will be useful. I’ll cover all the gears features and do some videos of them in use. I’m aiming for a fairly budget concious studio that anyone can afford to build that can provide great results.